This has been a secret until now, but I feel ready to be open about this. 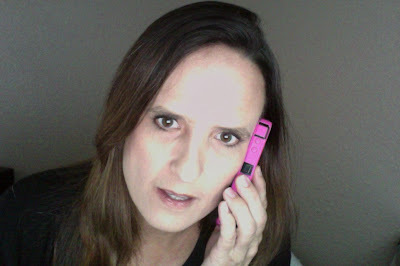 I’m in my office for my day job, on the computer, crunching some numbers, when my cell phone rings. [Amy] Hello. Can I speak to Carol Ramsey? [Amy] Hello, Carol. This is Amy Poehler. [Amy] I just read your post about your interview with Meredith. That was a very good piece of writing. [Amy] I can tell from this one small writing sample that you are very talented. Your writing is strong, technically and artistically, and you are also very funny. [Carol] Oh, my, thank you very much. [Amy] I’m calling today to offer you a writing job. [Carol] That would be great, but I have a family to support and my teenage daughter starts college in a few years. [Amy] Oh, you mean that rumor that writers early in their career don’t make much money? That is just a rumor. You would make about the same as you do now, as a software professional with twenty years of experience. [Carol] Wow, that is great. [Amy] We need you Carol. The world is ready for what you have to say. This may seem like a lot, but I have been in a vulnerable place. I have a vision about encouraging family experiences with hiking, live music and art. I want to believe that, on a given weekend, there are a few dozen of families in Austin that are hiking on Bull Creek, dancing at Guero’s or making art on a Second Saturday at Laguna Gloria because GrowingUpAustin made it easier. But I know how to crunch numbers and I know that I don’t have the reach to make that happen, not yet. [Karen] Back before your writing was discovered and you had to write day-in and day-out and often late at night, feeling like maybe not many people were reading, how did you keep going? Oh, my. Then I got back to work again. But, I was wondering, if you are a blogger, what is your blogging fantasy? In my last post, I explained the events and thoughts leading up to my interview with Meredith Walker, co-creator of the Smart Girls at the Party YouTube channel, with Amy Poehler. 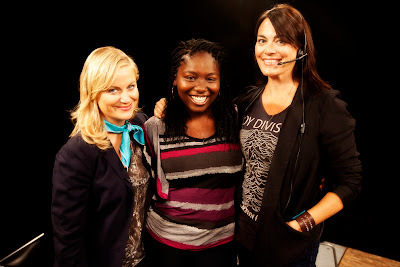 The picture above is Amy, Kayla and Meredith; Kayla was interviewed for Smart Girls. Here is my interview, more or less. I had two feelings going into the interview: A) The Smart Girls at the Party might be something really special that could have a significant positive impact on girls and B) This is another self-help story that sounds and feels good, but when you look closer, can be reduced to familiar superficial platitudes. [Meredith] Carol, you look absolutely fantastic! [Meredith] We’ve talked to a lot of young girls who try new things and are willing to look silly while they learn. They don’t always follow the most obvious, cookie-cutter path and they make their own way without worrying to much about what people think. [Carol] You said that the girls you interview for Smart Girls are both ordinary and unique. Isn’t that the same as saying everyone is special? [Meredith] But that way of thinking is far too narrow. It doesn’t bring into the discussion the value that each person can have for the good of the community. The old saying about taking a village may be trite but still rings true. We need the contribution of each other, not just those whose achievements are easily recognized. I think it’s cynical to separate the world into winners and losers based on supposed achievement. Sure, the world needs heroes. But, the supposedly smallest contribution, offered authentically, can make a world of difference. And I think that is heroic too. [Carol] What does happiness look like? [Meredith] Happiness is ordinary. There are no bright lights or sound tracks. It isn’t rich or famous. It is quiet and simple and ordinary and there is enough of it for everyone. Also, it isn’t a list of facts to memorize or tasks to complete. It is an idea and a feeling that takes practice and patience and acceptance. It took a while for it to all sink in. I was convinced. Smart Girls at the Party really is something special. I thought about quitting my day job so I could intern with Smart Girls for free and then my teenager could work instead of going to college in a few years. But I thought again about what I had learned. Happiness is in the ordinary. It is with my family, in our house, eating fish and broccoli for dinner. It is getting to write after the kids are in bed. It is our camping trip coming up soon. If you know any girls or Moms or Dads with girls (or boys or adults) who might appreciate the Smart Girls at the Party story, please share their link with them, with this post or any other way. Smart Girls aren’t flashy or gimmicky, there are no Rock-n-Roll tours or Super Bowl ads, but I feel like every girl in the world should know about it, in case it might be something that speaks to them. Also, Meredith Walker is speaking as part of the Young Women’s Program at the Texas Conference for Women in Austin next Wednesday on October 24th. This program is intended for Juniors and Seniors in High School and registration for students is just $75, with a student ID. Kids are in classrooms most of the year, the conference could be a different type of learning. (The conference folks can even help with a school excuse!) Spread the word if you know someone who would enjoy this! The clock said 10:20. I was scheduled to interview Meredith Walker, co-creator of the Smart Girls at the Party YouTube channel, at 11:00. Smart Girls at the Party includes a web series and community site for adolescent girls, encouraging them to change the world by being themselves. Meredith is part of the Young Women’s Program at the Texas Conference for Women, which will be at the Austin Convention Center on October 24. I had managed to prepare for the interview for two hours without writing down a single question. Then I realized I didn’t have any clean pants that also fit. And then I remembered that I was a blogger, not a journalist, whose blog wasn’t even about adolescent girls anyway. It’s isn’t that I didn’t try. I had spent the morning watching Smart Girls at the Party, Girls of the World and Ask Amy videos on You Tube. I lost track of time because I couldn’t stop watching. Well, it wasn’t me watching really, it was my twelve-year-old me, feeling how I felt back then, and imagining how good it would have felt to hear these words. It was my twelve-year-old me hearing that it’s going to be OK, and my 45-year-old me feeling a little more calm for believing it. Part of me felt that this might be something really special, a gem of wisdom and light in a sometimes dark Internet world. The other part of me wasn’t convinced. When I hear someone say I should ‘be myself,’ I don’t really know what that means. The next thing you know, they are going to say that everyone is special. By 10:40, I finished my questions. Then I had to decide if it was better to wear dirty pants that fit or clean pants that make it slightly hard to breathe. (I chose the clean ones.) Then I tried to print my questions and my printer ran out of ink. I made it to Central Market on time. I got a cup of coffee. I waited. In my next post, I’ll tell you how it went.